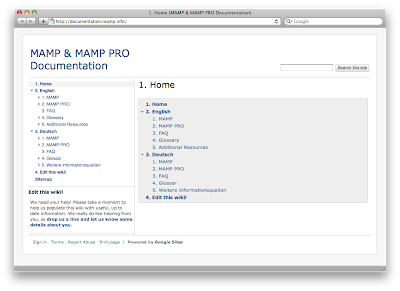 We have just finished the transition of the MAMP PRO PDF-based documentation into an online version. Some entries have been updated others have been added. We also started to add a documentation for the free MAMP, but it is very basic yet. The new online documentation is available as a wiki. So everyone has the possibility to join and improve it. We hope to solve problems and answer your questions much faster this way.